The GM Genie: a blog for innovative game masters: Location: The High Council Chamber of Spaaaaace! Location: The High Council Chamber of Spaaaaace! In FAME, the super-celebs of the solar system meet here to engage in space-politics. It’s a wide platform of adamantine. Grecian-style columns form a perimeter, but there’s no roof or ceiling. Depending on who and what lives here in your game, the High Council can be open to space or protected with an oxygen bubble. The High Council’s size is likewise self-adjusting, designed to accommodate infinite guests. The platform, columns, etc., are being continuously summoned into our universe from a plane of adamantine (the only way possible way to work with this material since it is absolutely un-cuttable) with carefully crafted equations. Its size readjusts at any given moment to remain directly proportional to how many people are standing on it at the time. The entire chamber, however, exists in a carefully constructed bubble of subspace, so regardless of its current size it always takes up the same amount of “real” space. Furthermore, spatial restructuring inside this bubble ensures that no matter where you stand on the platform, you can always be heard from the center and it is always a short walk to the other side. The spaces between the columns function as doorways. 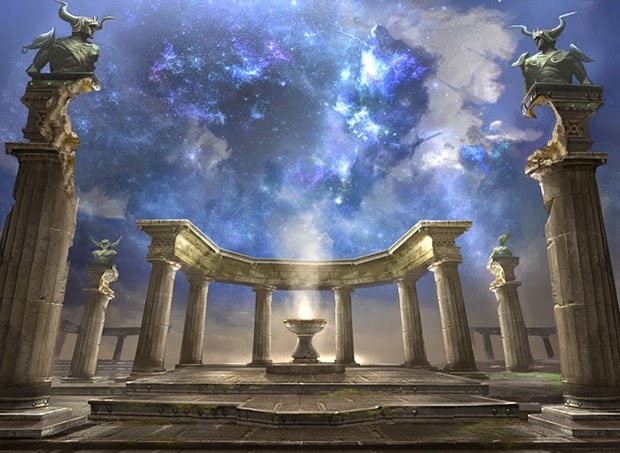 Those who have eaten of the nectar and ambrosia can step into the High Council from any point in the universe – provided they go back the way they came (in order to maintain balance, of course). These modifications make the High Council the ultimate “round table.” And, needless to say, simply setting foot there can be a disorienting experience if you are accustomed only to normal space.